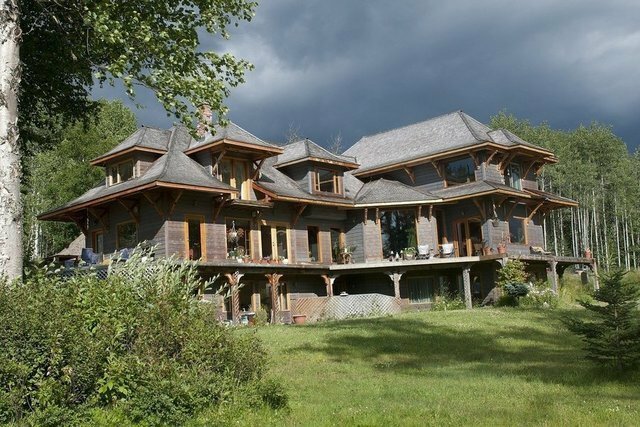 HAYDUKE RANCH Impressive property with far reaching views over the surrounding Bulkley Valley countryside, and Coastal Range, fronted by Bulkley River and to the East by Mt. Cronin wilderness Area. Great location, an ever-changing landscape of an outstanding natural beauty. Amazing opportunity to own a piece of Smithers most premier farm properties. Nearly 150 acres, (80 acres cultivated) of mix prime farm land along the Crown Land; almost all in hay crop or horse farming. The house is full of charm and character with a lovely garden together with all useful outbuildings; this property makes a fabulous family home with 900 sq.ft. Guest House or an upmarket Guest Ranch. Over 5,520 sq.ft. mortise/tendon timber frame Main Lodge/home boosts 5 bedrooms, 4 full baths 2x2 pieces Baths. High ceilings, stunning entrance, lovely country kitchen with island; pantry, large dining room and living room lend to wonderful entertaining opportunities with wraparound decks and patios’ off front side and back of house for outdoor living. Outbuildings: Two car detached garage, 700 sq.ft. Shop, 2688 sq.ft two level Barn, 8’x8’ Power Hose; 96 sq.ft. Fuel Depot. All measurements approximate; Buyer to verify if deemed important.